This morning I modified the TPU server, so that it uses the new master browser at master.bf1942.sk (109.71.69.254). The new master browser is a replacement for the Gamespy master browser master.gamespy.com (69.10.30.248). When the Gamespy master server stops functioning on June 30, 2014, TPU will still be listed on the new master server, so you should have no trouble seeing TPU in the in-game server browser, as long as you have also updated your client computer's HOSTS file. Alternatively, you can download a small program (Gamespy Patcher) that will make the change for you. This change tricks the BF42 client into thinking that master.gamespy.com is at 109.71.69.254 instead of 69.10.30.248. 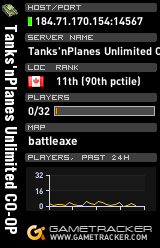 When you look at the in-game server browser, you should see most of the servers you saw previously, including TPU (Tanks 'n Planes Unlimited COOP). You can see a list of the BF42 servers that are being tracked by the new master browser by navigating your web browser to http://master.bf1942.sk/. To reiterate: when the Gamespy master browser stops working on June 30, everything should continue to work normally, as long as you've made the change to your client computer's HOSTS file. If you don't want to change your HOSTS file (but really, there's no reason not to), or if the new master browser stops working for some reason, you can always join TPU directly. In the game, click MULTIPLAY, INTERNET, ADD SERVER. Enter the IP address of the TPU server (24.86.121.160; see the GameTracker widgets at the top of this site) and click the JOIN button. Click OK to save the new shortcut. Double-click it to run BF42 and automatically join TPU. I will definitely let you know if I experience any problems on the 30th and after. But as of now, everything seems fine. I will be updating TPU's sister server later today. I will send feedback on that too. Correction- I was advising when I update BF2 on my end.